Introduce these Street Twill Skinny trousers into your 9-to-5 routine, and beyond. They are made fro..
Update your separates for the new season with this wardrobe staple. Crafted from a comfortable co..
98% Cotton, 2% Elastane ..
A comfortable loose fitting side zip patterned elasticated waist trouser. Made with 100% polyeste..
Sumptuous velvet brings an of-the-moment feel to the Five Pocket Skinny Jeans this season. They have.. Your off-duty style deserves effortless pieces which promise comfort. The Washed Cupro Jersey Jogger.. Mix smart-casual tailoring with relaxed athleisure influences in the Whisper Ruth Tailored Joggers. .. 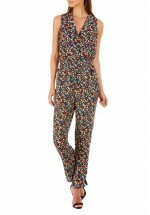 This colourful Fran Belted Jumpsuit from Sugarhill features a crossover front, a fitted waist and br..
Yumi's full length wrap front black trousers feature comfy waist band, turn ups and straight leg cut..